WASHINGTON —David Goldman remembers the relief he felt on Christmas Eve 2009, when he emailed “wheels up” to family and friends, letting them know that he and his son Sean were on a plane heading home. That day came five years after Sean’s abduction to Brazil by his mother. He hopes final passage Friday of abduction-prevention legislation bearing their name will help other parents know that relief. The Sean and David Goldman International Child Abduction Prevention and Return Act passed the House unanimously Friday by voice vote and now awaits President Barack Obama’s signature. The bill, sponsored by Rep. Chris Smith, R-N.J., and Sen. Robert Menendez, D-N.J., is designed to help the State Department put increasing pressure on foreign governments to send home American children who are abducted overseas. It also requires better reporting and support from the State Department so that left-behind parents are not on their own in overseas battles to win the return of their abducted children. Smith originally proposed the legislation five years ago, after personally intervening in the Goldman case. Sean was 4 years old when he was abducted in 2004 by his Brazilian mother, who later died. His father drove them to the airport for what he thought would be a vacation. Three days later, he got a call from his wife on Father’s Day to tell him she wasn’t bringing Sean home. Goldman credits the work of media outlets and pressure from U.S. government officials in helping him reunite with his son. He choked up, talking about Smith’s efforts. “When he takes up a cause and believes in it, there’s no stopping him,” he said. After learning the House would take up the bill Friday, Goldman, a charter boat captain, said he raced home to watch the vote on C-SPAN with his family. Sean turned 14 on May 25, International Missing Children’s Day. A big grin spread across his face as he realized what was happening, his father said. He reached for his Dad’s hand and shook it. “He’s very proud to have his name on a piece of legislation that will go on our national laws forever to help families and children reunite and end the suffering,” Goldman said. 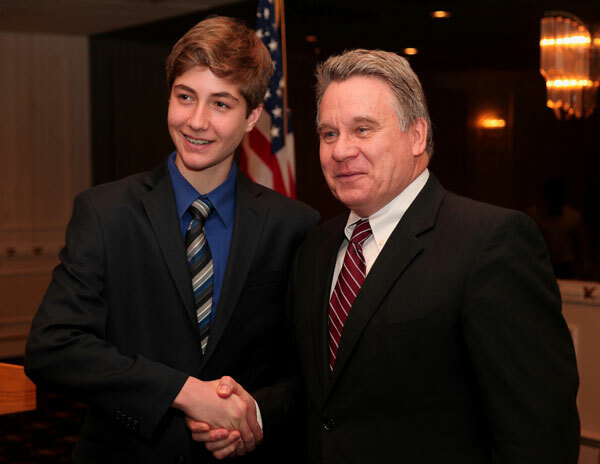 PICTURED: Sean Goldman and Congressman Chris Smith. Among its provisions, the bill provides eight steps the administration should take, increasing in severity, when a country refuses to help resolve overseas abduction and access cases involving American children. They range from a petition through diplomatic channels to a withdrawal of U.S. assistance to a formal request for extradition. The bill urges the administration to pursue bilateral agreements with countries to locate and foster the return of abducted children and protect the access of the left-behind parent to the child. The State Department’s position is that it can’t help parents of children who were illegally taken to countries that haven’t signed The Hague Convention on the Civil Aspects of International Child Abduction, Smith said. With this bill, he said, parents with children held in “non-Hague” countries can work with the State Department. “They won’t be on their own, far from the United States, desperately trying to get their children back,” Smith said. Goldman, who co-founded the Bring Sean Home Foundation to help parents in similar situations, said the bill lets other countries know “we mean business” and that they will be punished if they refuse to help return abducted American children. Goldman said he had no big celebratory plans for Friday night. He dropped off Sean at a friend’s house. He may watch “Jeopardy” with his wife, Wendy, before turning in early. Goldman said he’ll begin to celebrate when he starts to see more children coming home to their waiting families. More than 1,000 international child abductions are reported to the State Department each year. Follow the Bring Sean Home Foundation on Facebook (http://www.facebook.com/BringSeanHome). Federal lawmakers gave more ammunition to American parents whose children are illegally retained by family members in other countries when the U.S. House of Representatives today passed a resolution inspired by a Tinton Falls father whose son was held in Brazil by his wife and her parents for more than five years. The Sean and David Goldman International Child Abduction Prevention and Return Act, approved by the full House of Representatives, authorizes the U.S. State Department to take increasingly forceful measures against any country that does not help return an American child not illegally held there. In 2004, David Goldman’s wife left with their 4-year-old son Sean ostensibly to visit her parents in Brazil. Instead of returning home, she divorced him and eventually remarried. After she died from complications from childbirth, her parents refused to return the boy to his father, touching off a bitter 5½-year international legal and political fight that went all the way to the State Department. A court in Brazil finally ordered Sean returned to his father. Goldman, with strong backing from U.S. Rep. Chris Smith (R-4th Dist. ), turned his case into a very public appeal to tighten weaknesses of international child abduction treaties. The House originally passed the measure, HR3212, in December but addressed it again today after the Senate approved it with some modifications on July 16. It now goes to President Obama for his consideration. U.S. Rep. Bill Pascrell Jr., cosponsor, said he’s working with another father, Mike Elias of Rutherford, whose wife took their two children to Japan four years ago. Elias, an Iraqi war veteran Marine sergeant, is also involved in a bitter custody dispute. “Today’s passage of this critical legislation will bring us one step closer to reuniting families that were wrongfully torn apart while preventing abductions from happening in the first place,” Pascrell said. Among its provisions, HR312 requires the State Department to produce a comprehensive annual report on international parental child abductions. That report must include information on whether the government of a country in question has a history of non-compliance with child abduction cases. It also requires U.S. diplomatic and consular missions to monitor abduction and access cases and to work out agreements with countries that are unlikely to join the Hague Abduction Convention, which sets rules for handling international child abduction cases. The measure also authorizes $1 million for each of the next two years for judicial training for those countries that have a pattern of non-compliance or that have a significant number of unresolved abduction cases. “Passing this legislation will focus attention on this heart-breaking issue, assist parents in bringing abducted children home where they legally and rightfully belong and bolster prevention so that children are less likely to be abducted in the first place,” said U.S. Sen. Bob Menendez (D-NJ), chairman of the Senate Foreign Relations Committee and a co-author of the resolution. PLAINSBORO— A local mom’s desire to regain custody of her abducted children will soon lie in the President’s hands. A bill that would help Bindu Philips bring back her kids, who allegedly were kidnapped and taken to India by her abusive ex-husband in 2008, is on its way to President Obama’s desk, according to a release. The lead champion for the bill, U.S. Rep. Chris Smith (NJ-04) introduced the legislation over five years ago, as a way to prevent international parental child abduction. On Friday, Congress gave their final approval to The Sean and David Goldman International Child Abduction Prevention and Return Act. According to Philips, her husband Sunil Jacob, 45, took the family on a vacation to visit his extended family in Kerala India. However, when it was time to leave, Jacob and his two twin boys did not board the plane, forcing his wife to leave the country without her then five year old boys. Smith’s legislation will give the State Department a variety of tools to pressure “non-Hague treaty” foreign governments — like, India — to send back American children abducted to overseas destinations. Better reporting and support from the State Department is also at the core of the legislation empowering “left-behind parents” to fight and possibly win overseas battles. The Hague Treaty provides details for the quick return of abducted children to their home country, and helps to facilitate visitation between parents and children while the case is pending, according to the release. However, many Hague signatory countries, like Brazil, refuse to follow the guidelines set by the treaty and many parents are left fighting a losing battle when their children are abducted. If signed by the president, the legislation would impose stringent sanctions like the withdrawal, limitation, or suspension of U.S. development assistance, security assistance or foreign economic support, just to name a few. According to the press release, more than 1000 international child abductions are reported to the State Department’s Office on Children’s Issues each year. The National Center for Exploited and Missing Children reported that there have been at least 168 international child abductions from New Jersey since 1995. WASHINGTON—Today, nearly five years after U.S. Rep. Chris Smith (NJ-04) introduced his first bill to prevent international parental child abduction standing alongside “left behind” parents in front of the Capitol, Congress gave final approval to his legislation, The Sean and David Goldman International Child Abduction Prevention and Return Act, House of Representatives Bill 3212 (H.R. 3212). Smith wrote the original proposed legislation in 2009 subsequent to his personal intervention in the fight to bring Sean Goldman home to New Jersey, years after he had been abducted to Brazil by his mother. Smith’s successful work with Sean’s father, David, and a team of lawyers—including Patricia Apy, of Red Bank, NJ—and volunteers helped bring Sean home, but also uncovered gaping weaknesses in U.S. law and the need to codify best practices so that other Americans will also see their children returned home. “In the five-year push to turn this bill into law, we have seen a sea of change in the Congress’ and State Department’s understanding of international parental child abduction—an understanding that these abductions are a form of child abuse and a human rights violation. There are many heartbroken parents waiting for this bill to help them in their fight to see their children again. David Goldman watched the final House approval on television today with excitement. He stood by Smith in 2009 when the legislation was first unveiled. During his five year struggle, Smith has authored four versions of the bill (HR 3240; HR 1940; HR 1951 and HR 3212) using each to educate his colleagues and make modifications aimed at winning widespread support in an increasingly partisan Congress. In December 2013, the House passed Smith’s bill, 398-0. Smith noted the work of Foreign Affairs Chairman Bob Menendez and Ranking Republican Bob Corker when the bill passed the Senate on July 16th, with some final modifications. Smith named the bill after David and Sean Goldman who have been reunited in Monmouth County for nearly five years. Following Sean’s return to New Jersey, David Goldman has stayed active in promoting the legislation in an effort to spare other parents and children the painful, illegal separation he and his son endured for five years. The bill also—for the first time—urges the Administration to enter into Memorandums of Understanding (MOU) or other bilateral agreements with both Hague Convention and non-Hague Convention countries, to locate and foster the return of abducted children and protect the access of the left-behind parent to the child. In order to ensure better accountability of the Administration and to warn U.S. judges who may allow a child to visit a country from which return is difficult, the bill significantly enhances reporting on country-by-country performance. Smith noted that countries that have signed the Hague Treaty, like Japan, may still need an additional MOU to help those left-behind parents that were separated from their children prior to treaty accession.